… Has a fascinating head. Unorthodox in shape, lustrous in sheen, it looks like the sort of bonce that if poked would give a little before springing back to its original form with a satisfying ‘Boing!’. Looks can be deceiving though because underneath that pleasing smile and placid eyes lies quite the QT ruffian who should only be trifled with cautiously. We’ll leave aside the matter of the expenses questions for now as a) it’s just as dull as it was five years ago and b) he had no other option than to play dumb given how he’s just slipped into a politically dead woman’s shoes. No, let’s go straight to the next (and far more interesting question) about the London housing bubble for it is here we begin to see another Sajid emerge – a steely, hardboiled Sajid with a bandolier full of economic data and a shoulder holster packed with animus for those who cried ‘Bubble!’ (which at this point is roughly 98% of people with half a brain). All of a sudden that serene and unassuming visage dissolved into something much more bellicose and hostile: ‘A bubble you say? Well try THESE NUMBERS ON FOR SIZE!”. In fact, so robust was his defence of a position that is self-evidently indefencible that I nearly ended up going along with it until he spoilt it all with the now customary It’s All Labour’s Fault manoeuvre. This though was only a taster of just how unboingy his head is as his real party piece came later on with the question about tuition fees and the fact that they’re probably never going to get paid. After some perfunctory sparring with Harman, Sajid did the unthinkable: He craned his neck to the left, casually scanned Dimbers’ notes and then called codswallop on them. Now, that may not seem like a big deal but considering how most panelists treat Dimbers (like an angry and wrathful deity who must be venerated lest he bring down great terror upon their homesteads) it is, doubly so given just how nonchalantly he pulled it off – almost as if to say ‘Yeah that’s right, I’m violating the inviolable Dimblesphere. What are you going to do about it’. And what did they do about it? Nothing, because they were all too busy cowering under the desk and bracing for the swarm of locusts that inevitably follow a Dimbers scorned. So yes, as performances go this was pretty impressive – for a Treasury Minister in Osborne’s Forbidden Palace of Divine Pain and Economic Punishment that is. However, that’s not his job any more. Now he’s the Culture Secretary and I’m pretty sure that his particular skill set may not translate so well to the more touchy-feely, wavy-gravy world of the arts. Still, what’s done is done and I for one will be seeking to placate our new Cultural Overlord which is why the next Questionable Time will be presented in Excel form. Good at having cake. Also good at eating cake. I felt a little sorry for Williams last night, mainly because she was trying so hard to do QT right and that nearly always leads to people getting QT wrong. The big mistake here is to take the general public at its word because we say an awful lot of things we don’t mean – like that we want politicians who propose solutions and appear relatively normal. This was the approach that Kirsty went for, dutifully listing policies and appealing to our sense of the ordinary but it just didn’t quite cut it because her answers didn’t leave any space for us to get a sense of what she’s all about: Sure we got the gist of what she’d do, but not who she is. So how can she straighten this out? Well if the opinion polls are anything to go by it’s to get a silly haircut, a clutch of outlandish views and never be photographed without a fag or a pint. It’s no secret that I have trouble with Billy Bragg (or to be more precise I have trouble with folk music and purveyors of folk music who are unconditionally doted on by every colleague who’s over the age of 40 and owns a pair of Dr. Martins – which given I work in mental health is all of them) so it is once again somewhat galling to confess that yes, he was very good last night. However, the real revelation was how well he and Martin Sorrell got on together – they just kept giving each other these knowing nods and unspoken glances that said ‘You’re alright you are’. Granted, it helped that they were strangely in agreement for most of the show but still, the spectacle of Man of the People/Salt of the Erf Bragg and Bottom-Liner/Champion of Capitalism Sorrell’s little bromance gave the show a nice little subplot. 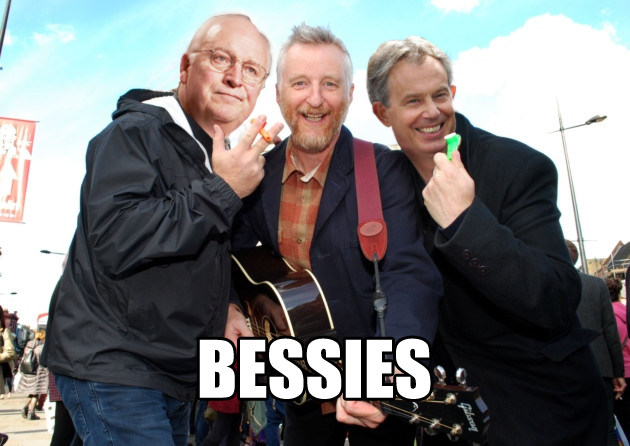 Whether this means that Bragg will be the new face Nestle remains to be seen but in the meantime, here’s the now traditional pshop of Billy Bragg Hanging Out With People He Doesn’t Like (see Fig. 1). Questionable Time: It’s nothing if not petty. Yeah yeah yeah, ‘Slough’ doesn’t rhyme with ‘tough’ BUT THEY LOOK THE SAME OK? 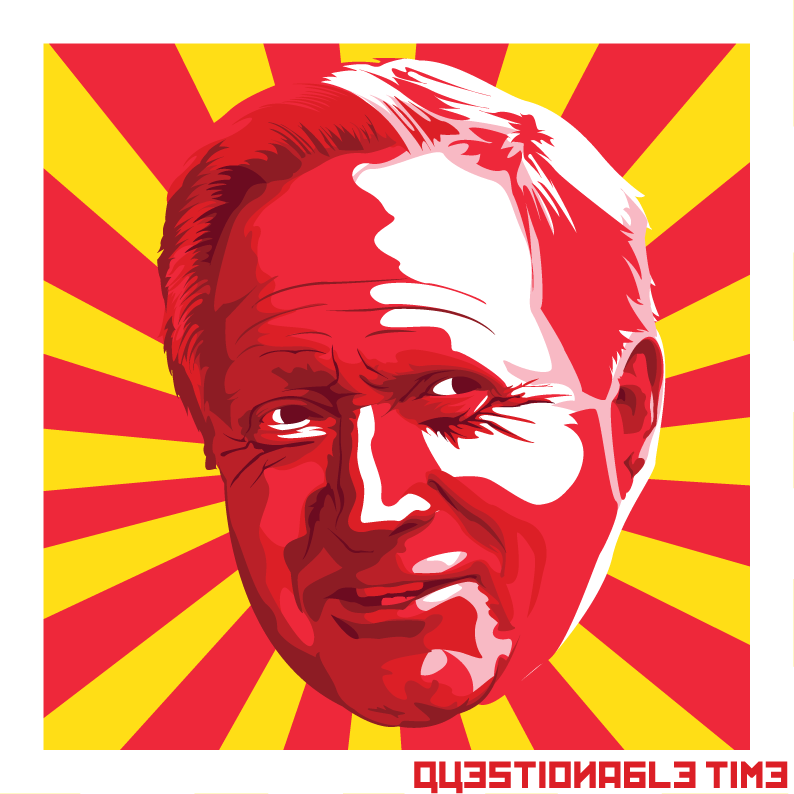 Right, that’s me done for Easter so enjoy the Dimblebreak and I’ll see you in May when QT will be in Leeds and I will undoubtedly be trying to infiltrate proceedings for Leeds is my turf. In the meantime, please feel free to acquire this rather lovely Questionable Time t-shirt. 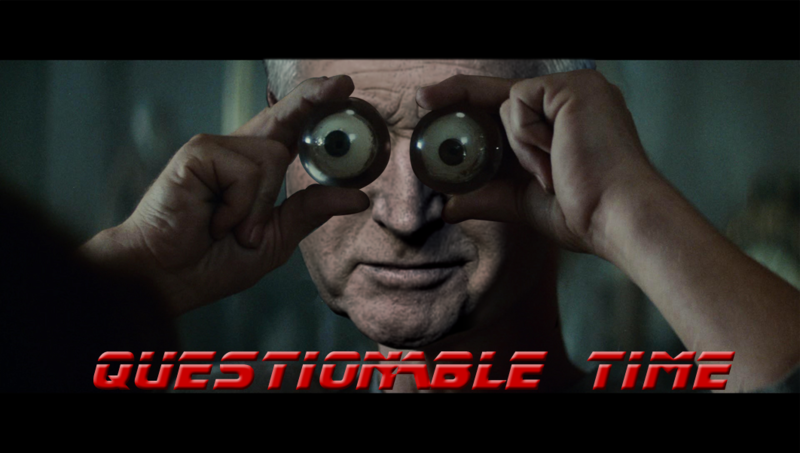 Good morning Lemmings and welcome to Meta-Questionable Time, a blog based around the events that transpire in Meta-Question Time – a television show in which David Dimbleby chairs a debate between politicians that focuses on a debate between politicians that was chaired by David Dimbleby earlier on in the week. Confused? Well don’t come crying to me because you bought this on yourselves, what with your Twitterbooks and Myfaces and Pinstergrams. This is a post-modern nightmare of your own creation and I for one will have nothing to do with it other than the 1000 words I’m about to dump below this paragraph. There, is that meta enough for you? Good. Let’s get on with this. It’s fair to say that the experience of coalition has been a harrowing ordeal for the Lib Dems but some have fared better than others. For example, in between handing over his dinner money to Tory prefects and being jeered by those uncouth Labour plebs Danny Alexander can look back on the last four years and say ‘Well, at least I got these snazzy new contact lenses out of the deal’. Vince though, what’s he got to show for it? Nothing. In fact, he’s got worse than nothing – negative nothing if you will – because prior to entering government, he was the man of the moment, the All Knowing Sage of Financial Catastrophe whose every word we hung on as the world we knew crumbled before our very eyes. Fast forward four years though and what have we got? 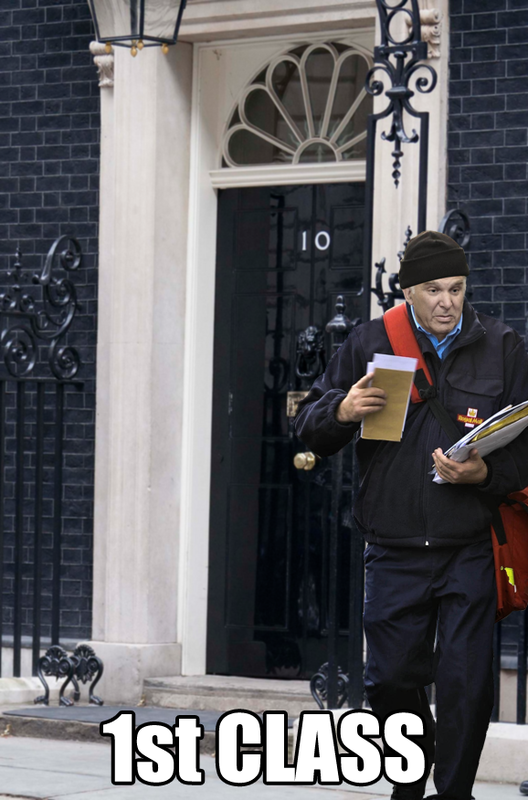 Vince, the Reluctantly Co-opted and Self-Loathing Bagman who has taken to insulting his own injuries by being the poster boy for the officially fishy looking privatisation of the Royal Mail. Oh what a fickle mistress coalition is. Anyway, all of the above is clearly a bitter pill to swallow for someone like Vince so it’s reasonable to expect him to be a little grumpy when called to account for how he’s played a shockingly bad hand – except that he didn’t seem grumpy. No, in fact he didn’t seems to be anything in particular other than serenely detached as he very slowly walked us around the deal like an estate agent casually explaining away the lack of a roof with phrases like ‘outdoorsy ambience’. It was completely without guile – no-one’s to blame/just one of those things/stuff that happened – and reminded me of something you occasionally see as a mental health worker: He was displaying classic signs of dissociation. To the uninitiated, dissociation is where you slowly start to become detached from reality (as opposed to wrenched from reality – that’s the territory of psychosis) and quite often this is because reality has become a thoroughly nasty place that you no longer wish to be a part of. Looking at Vince last night, the way he was just floating there – like he was viewing himself in the third person – it reminded me of cases I’d worked where people had folded the world into a box and shipped it to somewhere outside of their psyche. So this should be a cause for concern right? Shouldn’t we be phoning someone up? Making him an appointment or something? Well, not quite. Had this been the case all the way through the show then yes, I might start rifling through my address book but right at the end he came charging back into his own skin with the rallying cry of “Pupil Premium!”. Now, let’s briefly ignore the fact that the Pupil Premium is a fig-leaf policy that has zero-recognition with the general public and just take it for what it was in this context: It was an affirmation that there’s still a part of Vince that has a stake in reality and for that reason I won’t be calling in any favours with colleagues of mine. Still, if I was Vince I’d see this trend towards detachment as nature’s way of telling me that I might need a new job and as it happens I know a place with a few openings right now (see Fig. 1). I didn’t think I was going to get on very well with Camilla Cavendish – she looks too hard-of-head/long-of-neck/smart-of-cookie to sit comfortably on the Ribs Train but I have to admit that her idea about putting the prices on the side of medications was actually brilliant and almost bullet proof in terms of counter arguments. In fact, I’d go so far as to say that her whole innings was pretty impressive and despite my instinctive twitchiness for black-and-white/wrong-or-right types she was the only person who managed to cut through what was otherwise a very blustery and choppy show. So yes, maybe she could fit on the Ribs Train although I’m not entirely sure she would want to as I don’t put the prices on my tickets and the view of this uninspiring siding wears a little thin after a day or two. There was an interesting moment for Kwasi ‘Fair-to-Middling’ Kwarteng when it all could have gone wrong: The question about paying for GP’s appointments came up and you could see this little internal warning sign flick on – ‘DON’T SAY WHAT YOU’RE REALLY THINKING’. Granted, I can’t say with any certainty what he was really thinking but seeing how he’s one of the Britannia Unchained authors I think it’s fair to assume it was something along the lines of ‘Everyone should pay for everything’. Anyway, he caught himself before going off the deep end and gave an oblique answer peppered with pointed references to rising demand and life expectancy instead. It was a nice little dodge that more than enough made up for him saying “Really?” to Peter Hain at least a five times in a row. So this week he’s no longer Kwasi ‘Fair-to-Middling’ Kwarteng. No Lemmings, this week he is Kwasi ‘Middling-to-OKish’ Kwarteng. Try not to be dazzled by his mediocrity. I feel bad being hard on Peter Hain but the whole Moral High Ground Followed By Obligatory Mea Culpa routine just riled me a little last night. It’s not that I think he’s without conviction (far from it in fact), it’s just you get the sense that he’s in the process of cashing in his chips and the fire you need in your belly to make that play work is just ebbing a little (the senior moments – like forgetting who Nick Clegg was – didn’t help either). Still, he didn’t rile me as much as Julie Bindel did by saying all the right things in a way that instantly makes them sound wrong. Yeah, yeah, yeah, someone needs to ‘tell it like it is’ but it would just be nice if they could do so without adopted the form of a giant wagging finger. Woah, so that was all a little Vince heavy but hey, whatchagonnado? Nothing, that’s what – except possibly coming back next week where I will once again be trying very hard to like Billy Bragg and most likely failing.